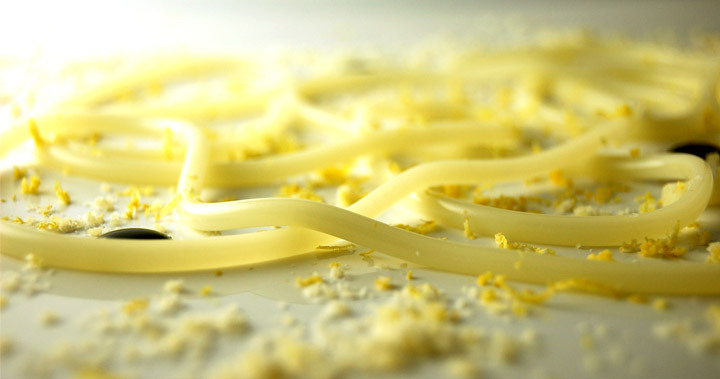 Agar Agar Spaghetti, also called molecular spaghetti or flavored spaghetti, is another creation of molecular gastronomy Chef Ferran Adria and El Bulli team. It consists of a spaghetto or noddle usually about 3 mm to 5 mm thick and 2 m long made of a flavored liquid jellified with agar agar (agar agar gelification). The agar agar spaghetti can be served cold or hot. The spaghetti are created by injecting the hot flavored liquid with agar agar into a PVC or silicone tube using a syringe. 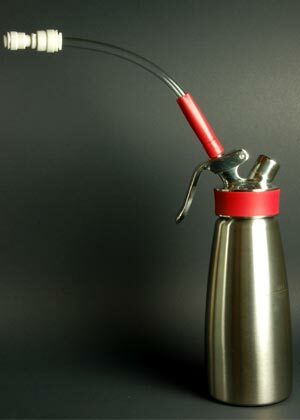 syringe with a nozzle that fits tightly in the tube and with a capacity of 40 ml or more. You can get the silicone tubes and syringe from our store. 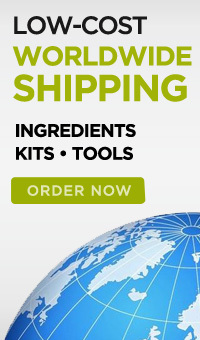 You can purchase the Molecular Tool Set or any of the molecular gastronomy kits with tools. I recommend you get one tube for each serving and not plan to reuse the tube for each serving since you’ll have to do it very fast to prepare all the spaghetti before the agar agar preparation sets in the pot. It is not worth the trouble trying to use the same tube for all servings. 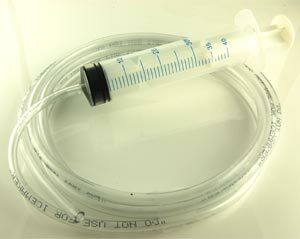 Silicone tubes are more expensive than PVC tubes but they will provide you with a tighter seal when you connect them to the syringe. You will also need a syringe to inject the flavored liquid into the PVC tubes and to inject air once the solution is jellified to remove the spaghetto from the tubes. Using the syringe to inject air could sometimes be a little challenging as air may escape from the syringe-tube connection and the resulting pressure may not be sufficient to push the spaghetto out of the tube. It works, but you'll have to be a little patient and fill the syringe with air multiple times until you get the spaghetto out of the tube. I've also read that Ferran Adria and el Bulli team use an adaptor for the ISI Whip to connect it to the PVC tube and remove the spaghetto using the nitrous oxide in the ISI Whip. I've never seen such adaptor but after trying different solutions, I figured out a way of constructing an adaptor very easily and at the same time inexpensive. All you need to do is buy a PCV tube of 9.5 mm (3/8") of external diameter and a coupling device from 9.5 mm (3/8") to 6.3 mm (1/4"). The 9.5 mm (3/8") tube will fit perfectly inside the ISI Whip straight decorator nozzle and the coupling device will allow you to connect this thicker tube with the thiner tubes you are using for the spaghetti. Try to buy a coupling device that is easy to connect and disconnect from the thiner tube since you'll have to do this for each spaghetto tube. You should be able to get these items from a hardware store since they are used for dishwashers, ice makers, beverage dispensers, etc. I purchased both items from Home Depot. The thicker tube is Watts Clear Vinyl Tubing SVGE10 3/8” x 1/4” x 10ft and the coupling device is a Watts Quick Connect 3/8 x 1/4 OD (1/4 x 1/8 CTS). This Quick Connect device is great because the tubes can be connected and disconnected very easily by just pushing to connect and pulling and holding a ring to disconnect. If you cannot find this brand in your country, just go to a hardware store that sells PVC tubes and ask them for a coupling device for the two tubes that are closest in diameter to the ones I used. Just make sure the thicker tube fits tightly inside the ISI nozzle. You can see my adaptor and the ISI Gourmet Whip in the picture. If you are using a silicone tube and you are not making many spaghetti you should be fine using a syringe. The agar preparation usually has a concentration of agar agar of about 1.6% to obtain a very firm jelly that is flexible but at the same time strong enough to hold its spaghetti shape without breaking when handled carefully. Agar agar needs to be heated to boil for jelling and sets at a temperature of about 35-45 ˚C (95-113 ˚F). Agar agar is very versatile and can be used with flavored liquids with high concentrations of salt, sugar, alcohol, acid and proteases. Coil each tube and hold with adhesive tape for easy handling. Fill the syringe with enough agar preparation to fill the tube. To give you an idea of volume, you need 30 ml to fill a 0.17” 2 m tube. Holding the coiled tube horizontally, start injecting the hot liquid with the syringe until it is full. Then place the tube in an ice cold water bath while you remove the syringe. Fill the syringe again and repeat the process for each tube you have. It will only take a minute or two for the agar solution to set in the ice cold water. You are now ready to remove the spaghetto from the tube. If you are using a syringe, fill it with air and connect it again with the tube. Press the syringe so the formed spaghetti can come out easily. This sounds easier than it is. You’ll need to create quite some pressure with the syringe and it is common to have air escaping from the syringe-tube connection. If this happens, apply pressure with your fingers around the connection to make it as tight as possible. You’ll probably need to fill the syringe with air multiple times until you get the entire spaghetto out of the tube. Try not to apply too much pressure or the spaghetto may come out too fast and break. Inject a little bit of air in the tube and wait a few seconds before going further. Once you see the spaghetto moving slowly maintain the same pressure with your finger on the syringe. If the spaghetto gets really stuck in the tube some people recommend putting the tubes in hot water for a few seconds to liquefy a little bit the outside of the spaghetti. I never had to do this. If you are using the ISI Whip adaptor, just charge the ISI Whip with the straight decorator nozzle, connect the adaptor and connect the coupling device with the spaghetto tube. Then, very gently press the ISI Whip handle to release some nitrous oxide and wait a few seconds. If you see the spaghetto moving, do not inject more gas. You want the spaghetto to come out slowly so it doesn't break. If the spaghetto stops moving, inject a little more gas and repeat the process until it comes out completely. You can keep the spaghetti covered in the fridge for up to 24 hours before serving. Agar Spaghetti can be served cold or hot (under 80 ˚C / 176 ˚F or it will melt). 1. Place some ice and cold water in a bowl. 2. In a pan place the liquid that you want to jellify. 3. Add the Agar Agar with a concentration of 1.6%. 4. Bring it to the boil, stirring constantly with a beater. 5. Take off the heat and skim to eliminate any impurities. 6. Fill the syringe with the preparation and connect the rolled tube to it. 7. Disconnect the tube from the syringe and place the tube in the iced water. Let it rest for 1 or 2 minutes. 8. Fill the syringe with air and connect it again with the tube. Press on the syringe pump and expel the spaghetti out of the tube. When possible expel directly onto the serving dish. Repeat as many times as tubes you have or required spaghetti.